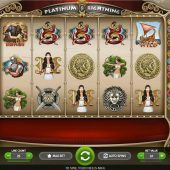 Platinum Lightning slot draws its inspiration from Greek mythology with Gods, Heroines and various other mythical symbols associated for this time in history. The game offers 5 reels, over 3 rows and 25 paylines and is certainly a high volatility slot. The RTP is 96.30% and is certainly touted as one of the better titles in the BGaming portfolio. The scatter symbol is Zeus and while he may not unleash a free games feature, he can trigger some huge rewards. 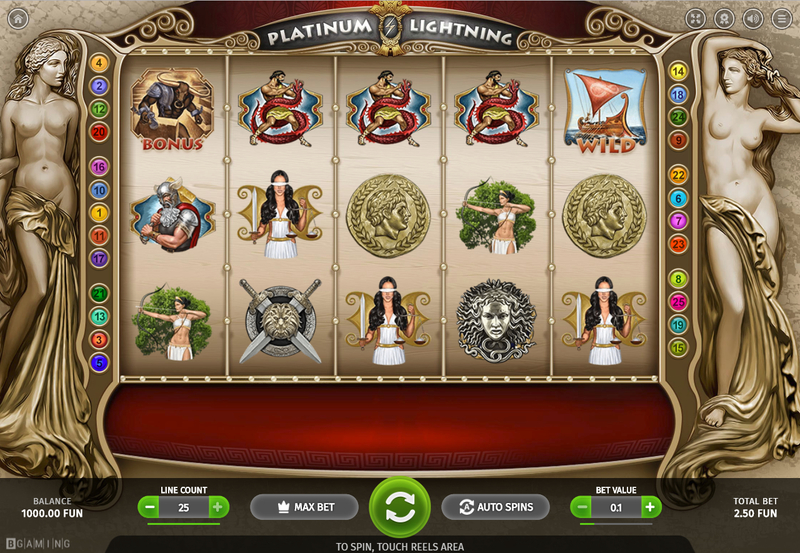 Land 3, 4 or 5 Zeus scatters on the reels and Zeus will fire out lightning Wilds across the reels offering 7x, 77x and 777x times your stake respectively. This can be very rewarding as you can imagine, but is also hard to hit. If you enjoy this theme then you may also like to try Zeus 3 from WMS or one of the Age of Gods series, such as Medusa and Monsters or Furious 4. All of which are certainly worth a spin.